Chris Pratt and Anna Faris announced their separation in August 2017 in a joint statement. So many times in Hollywood (and not in Hollywood), tensions rise during a divorce, as decisions are made on child support, spousal support, child custody, division of assets and debts, and more. Not for Chris Pratt and Anna Faris. Their divorce has been extremely amicable…almost unusually amicable. The pair has made their divorce as tension-free as possible by choosing joint custody, no spousal support, no child support and a joint bank account for their child’s expenses. In fact, in the divorce settlement, Chris Pratt and Anna Faris are required to live within five miles of each other for the next five years for their son’s best interest. The pair has a 6-year-old son, Jack. Both of them have expressed their love for their son, and their love and respect for each other, even during their divorce. If only all divorces were handled with this much grace and respect! 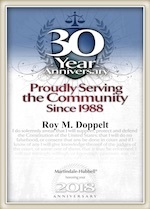 Call Doppelt and Forney, APLC for a free consultation at 800-769-4748 for assistance with your divorce, legal separation or paternity case. We represent clients in family law court in all of the court houses in San Diego County including downtown, Vista, Chula Vista and El Cajon. We proudly serve clients in San Diego and surrounding communities, including Chula Vista, Coronado, Carlsbad, Encinitas, La Jolla, Oceanside, Ramona, San Marcos, and Vista.